He is the very last surviving member of the original Option Wagon editorial staff. His 7 year road to becoming the chief editor consisted of many demanding tasks such as sanding FRP all night and staying the night in the mountains in a cold cabin for the next day's work. He is a single thirty something who does his job very well, but does not seem to fit the image of a chief editor. Option wagon resides at Dees Club, where other publications such as Option, Option2, Drift Tengoku, and JDM Option editorial staff all do their work under one roof. This company is the central antenna for where the latest Japanese automobile tuning info comes in. This place is a car enthusiast's heaven, where the latest news and exclusive information first come in before anywhere else. Our job is to gather all the latest info and input them properly to make a magazine. Making a magazine is to take the important information and make it interesting, with respect to the truth. Our secondary goal which is equally as important, is to make it appealing and fun to read. This is where the skills of editing are much crucial. A publication all begins with prior planning. We need to ask ourselves, "what kind of feature will make this article fun to read for our readers?" Not only that, but the magazine needs to sell in order to keep this publication, yet the company alive. So becoming lazy means letting our readers down, and if it means staying up consecutive nights in a row to get the job done, so be it. Our team must remain passionate and determined to produce a fine selling material. Well, with all that bold statement said, in the world of magazine editing, things are not so gravy. There are disputes and arguments among the staff of which article to cover. Basically, this entire company is made up of all car freaks. That's what makes things so difficult; some want to cover the cars that they are interested in. Some want to cover stories that they will mentally benefit from. Each person's desire serves as their motivation. Unless they are passionate about the article they are covering, it becomes difficult to write with enthusiasm. In this way, the contents of the pages are assigned to each staff editor each month. The next step is to decide numerous factors; whether the information is worth the print, where to schedule the assignment, booking the photographers, all result on the basis of a concrete page development. How pressured and stressed the writer becomes prior to the deadline depends on how fast and smooth the content gathering and the above process goes. There are two types of people in an editorial team. One that starts their work early, and the other bunch who goes into superhuman mode at the last minute to finish the article. The one who starts their work early is clearly the more intelligent being in this situation. Besides, the guys who wait until the last minute to do their article literally stink like pigs. With the deadline approaching, they don't even have time to bathe or shave, rather sleep. (you can imagine what they look like) Not meeting the deadline is an unacceptable concept. When all the contents and information are gathered, the page construction finally begins. The editor then chooses the photos the photographer had taken and puts it together with the produced text. The text is produced either by one of our editorial staff, or a freelance writer. These freelance writers all come from working as part of an editorial staff in the past, and now independently work as one. I think that the closest way to becoming a freelance writer or an automobile journalist is to start from becoming part of a magazine editorial group. Everyone starts as an amateur at first. In order to become a fully independent editor, one must keep accepting criticism and rejection from the chief for many years. They must keep moving forward by using the anger they have towards the chief editor, to one day become the best. When the text and the photos are determined, the article design begins with the use of a special computer software. Our staff provides the designers with the basic layout of the page, and leaves the article design companies to do the rest. After the article is completed, the editor then inspects the pages to determine if this article is worth the magazine. The people who can spot small mistakes are very good at this process. After the pages pass the inspection, they are included with the other pages to make up a magazine. I bet you are wondering what the chief editor does during this process. You might imagine the chief editor as a very controlling person who comes and goes into the office whenever they please, and enjoys his night life at the cabaret clubs. Let me tell you the truth. There might be some chief editors of a large publication that fit the above stated profile, but in our company that's not true. All the chief editors here don't even have time to be enjoying ourselves. We even go out ourselves and cover stories to meet the deadlines on top of our other tasks. We do everything including driving everywhere to gather contents. We are this involved in the production because we hold the privilege of making a magazine that we want. That is reason that kept me going all these years. This is from the April issue of our magazine. The staff member must decide whether to take care of the decision of whom, what, where to cover, who the photographer will be, and all the booking must be done. These processes can be done early. Or face "hell week" if put off until the last minute. The one holding the light reflector on the right is Mr. Kato. After the photos and the text are determined, the designer puts together the rest. Not like in the past, the time given to construct a page is very short. In the Option Wagon editorial staff, we are fortunate enough to have a in house designer as part of our group. DTP skills (desktop publishing) is a highly prized skill to possess in this industry. The basic standard that has never changed in terms of magazine editing is the use of a red pen. The pages being checked for text errors, design changes, are all marked with this pen. This is sort of a final quality check. This process is mostly done the night before the deadline in our editorial group. This was during the provisional period of Option Wagon in the December 2000 DIY issue. 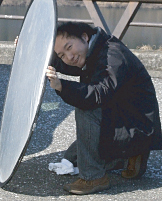 Mr. Kato can be seen modifying FRP body components day by day for his contribution to the magazine. He hasn't changed his ways a bit after 5 years.